Spending several weeks in Tokyo on a business trip in 2008, I was startled and enchanted to discover its human scale and its streets alive with people and plants. Like many foreigners, I assumed Tokyo would be all cold high-rises, crowded Shibuya scrambles, and flashing neon advertising. In short, I imagined the world's largest metropolis entirely removed from the natural world. I brought to Tokyo a lifelong interest in gardening. What surprises me still are Tokyo residents' ingenuity and passion for cultivating plants and community in a crowded, over-built city. 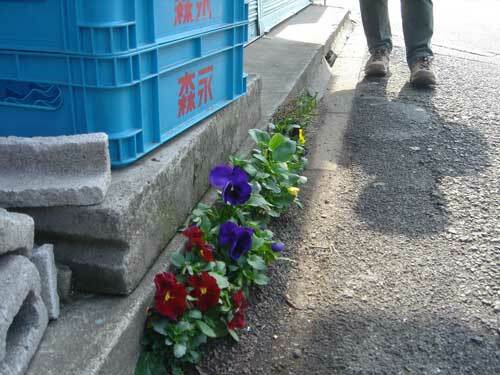 On leaving a beginner's ceramics class in a humble Tokyo neighborhood one day, I came across four perfect pansies growing in the crack of a narrow sidewalk. This image of Tokyo as a gardeners' city motivated me to relocate from San Francisco to research and write about Tokyo Green Space. Placing my research in the context of design anthropology and urban ecology, I was extremely fortunate to receive generous support in 2009 from Hitachi, which is committed to a Japanese approach to environmental protection and to cultural diplomacy. The sidewalk pansies show that Tokyo is organized differently than United States and European cities, and that many of these differences are nearly invisible to Japanese people. I formulated several guiding questions. Why do Tokyo residents care so deeply about their surroundings? What role can nature play in dense urban environments? 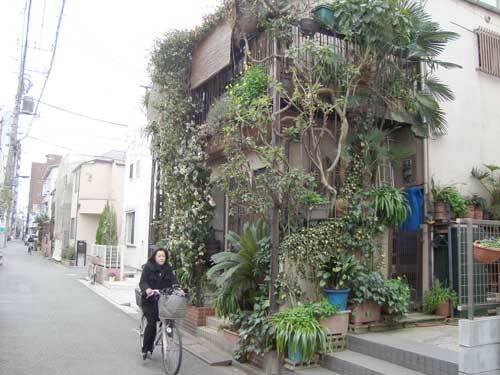 What can other cities learn from Tokyo's urban gardening culture? I began collecting images of gardens visible from streets and sidewalks. Surprises included a valuable bonsai collection growing on a private residence's cinder block wall; rice maturing in styrofoam containers; a single, exquisite mini-watermelon supported by a wooden stand in a Ginza backstreet. Sadly, in San Francisco and most developed world cities, these potted plants would be quickly stolen or vandalized. Meanwhile few Tokyo residents connect the respect shown to public plants with their unequaled personal safety in streets and transit. 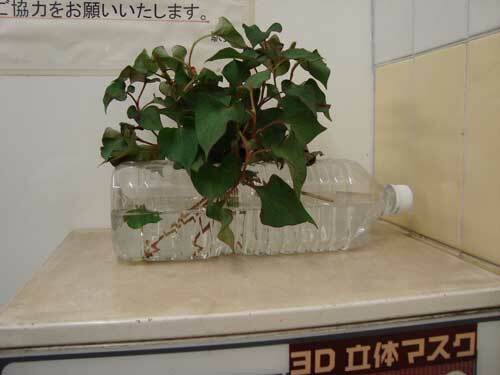 Rushing into a men's room in the Tokyo Metro, I glimpsed ivy growing in a two-liter plastic bottle lying on its side. In the twenty-first century, United States cities permanently closed their subway restrooms for "public safety." Here in Tokyo I could calmly imagine the anonymous person who beautified an underground utility with a living organism and minimal resources. Did he return regularly to change the water? What inspired his passion for plants and his kindness to strangers? Across the four seasons, I observed Tokyo residents celebrating nature together in public places. For hanami (cherry blossom viewing), it is common to see people sleeping overnight in parks and along rivers to reserve spaces for blue sheets and the next day's outdoor party for family, co-workers, or friends. The pink cherry blossoms transform the entire city as boisterous crowds share drinks and food. 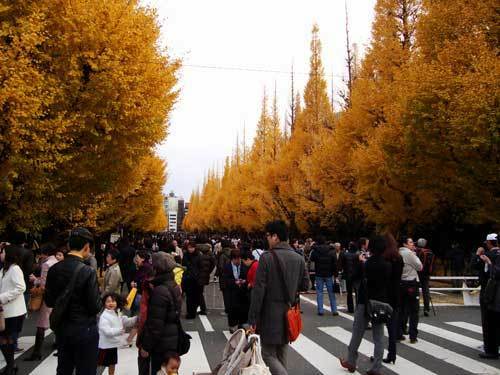 In fall, many thousands view ginko trees turning bright yellow in Aoyama, and special evening "light up" displays of red maple trees in traditional Japanese public gardens. Ancient Shinto omatsuri (street festivals) in summer and fall replace auto traffic with public rituals, music, costume, food, and more drinking. These events connect city neighbors with each other and with Japan's rice farming past and present. 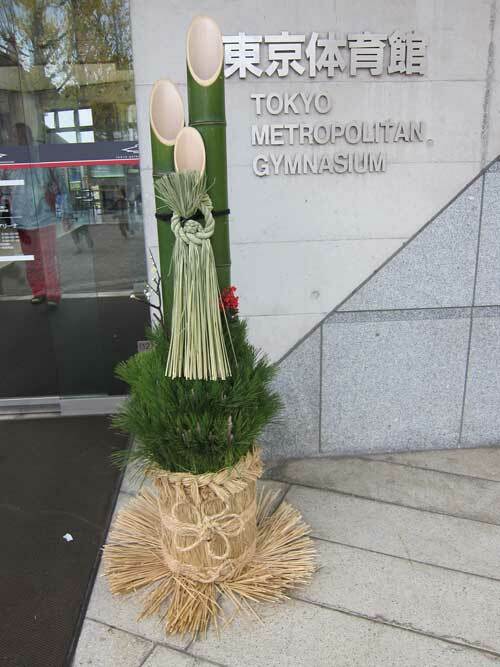 And for the new year, the doors to homes and business are decorated with shimekazari and kadomatsu-- made of rice, bamboo, pine, straw, berries, and paper-- that unite living rituals, craft, and nature in the city. Daily life in Tokyo is remarkable for its small streets where pedestrians and bicyclists have priority over cars. Only recently, a few United States cities are promoting these single-level streets, which do not segregate pedestrians to the edges, as a novel experiment for "livable streets." In Tokyo they are the common streetscape for countless unnamed streets that fan out in webs between train stations and large boulevards. Walking from my apartment to nearby train stations, Tokyo's distinctive streetscape encourages proximity with many small gardens and their gardeners. Because most homes are built directly to the property line, gardens spill out into small streets or climb vertically against the walls. On any given day, I encounter at least one neighbor planting, weeding, pruning, or sweeping. Even a few words of Japanese are enough to start a conversation with neighbors eager to share stories and their love of plants. Getting to know my neighbors though their gardens has made my urban life more like a friendly village than an impersonal metropolis. Hearing itterashai (have a good day) on my departure and okari nasai (welcome home) on my return, it feels like the physical and social boundaries of my small apartment have extended outward into the city. In return, I thank my neighbors for taking such good care of their gardens and our shared urban space. 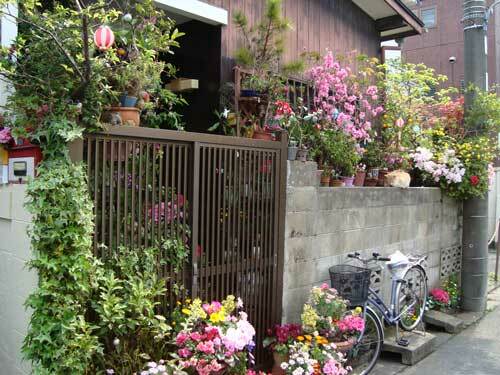 What accounts for Tokyo residents' distinctive love of gardening and nature? The Ota Museum's Edo Gardening Flowers exhibit last fall recalled how the earliest Western visitors marveled at the city's unique gardening culture. Hundreds of uikyo-e (wood block prints) feature flowers and plants in a variety of urban settings including kimonos, festivals, nurseries, educational materials, Kabuki actors, and Noh dramas. Unlike Western cities of the time, Edo's passion for gardens extended to all sectors of society, including common people as well as court nobles, shoguns, and artists. Perhaps there is something circular in my modern day discovery of Tokyo's gardening culture. Why are Westerners still unaware of this unique feature of Japanese urban life? While gardens once served primarily for relaxation and entertainment, their role today could be even more profound, given global urbanization and climate change. Creating urban forests will clean the air and water, reverse the heat island effect, lower crime, improve mental health, encourage mass transit, reduce the carbon footprint of the food supply, and promote biodiversity. As a foreign resident, or more accurately a resident alien, I already benefit from the increased sense of community and well-being that public gardening brings to even recent arrivals of the world's biggest metropolis. Many Japanese assume that improving Tokyo requires importing ideas from the West. On the contrary, I believe that Japanese do not realize Tokyo's unique cultural, spatial, and, above all, human resources which can make urban life even better in Japan and around the world.